If you’ve ever taken the long way home to avoid a path that seems unsafe, you can sympathize with unicornfish in Fiji’s Votua marine reserve. A new study has shown that herbivorous reef fishes alter their foraging behavior to avoid running into sharks. In other words, even though sharks don’t eat seaweed, they help influence where seaweed grows. Since seaweeds form entire habitats, the desire to avoid sharks has a ripple effect on the entire ecosystem. The discovery of this unappreciated role further demonstrates the value of healthy shark populations. While ecology has traditionally focused on how predators influence prey via consumption, there is an increasing recognition that other kinds of effects—so-called “non-consumptive” or “fear ecology” effects—are important, too. “When predators exert a non-consumptive effect, their mere presence in the environment causes a prey species to change its behavior,” lead study author Douglas Rasher, of the Bigelow Laboratory for Ocean Sciences, told Earther. These behavioral changes often involve prey species either feeding in a different part of the ecosystem, or eating less in general. Predators can cause fear ecology effects even if they are rare or don’t regularly hang out in an ecosystem. In the study, Rasher and his team looked at relationships between sharks, herbivorous fishes, and seaweeds in a shallow coral reef in Fiji. Seaweeds that grow on the top of the reef are only accessible to herbivores during high tide—which is also when sharks can enter the backreef. 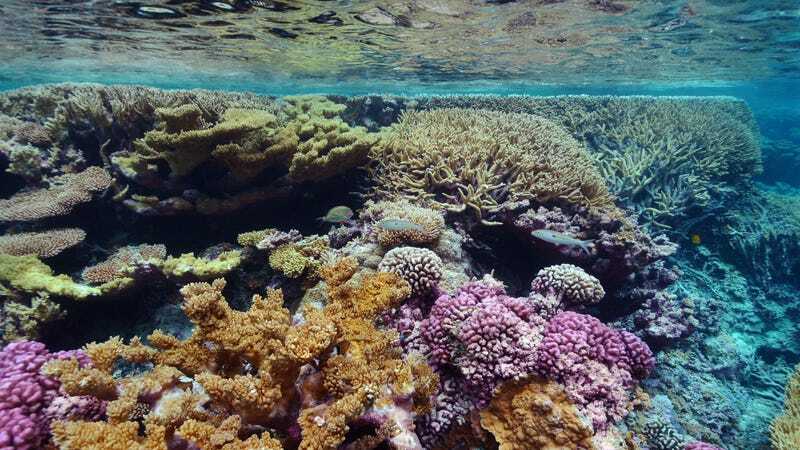 Through a combination of underwater videography and experimental measurements of herbivory, these researchers spent months observing a complicated coral reef food web. “At low tide, when sharks are absent and predation risk is low, herbivorous fishes voraciously feed on turf and fleshy algae in the lagoons,” Rasher said. “Lagoons therefore harbor little algae.” The algae growing on top of the reef, however, is only accessible to herbivores during high tide, when sharks are also able to enter the habitat. The presence of sharks seems to keep herbivores away from the seaweed at the top of the reef. Scientists have previously documented many cases of sharks influencing the feeding behavior of other animals, including dolphins, dugongs , and tarpon. But this is the first case of fear of sharks influencing the physical structure of a coral reef ecosystem. The idea that the loss of sharks can have negative ecological impacts is often used as an argument for the conservation of this imperiled group. But it remains an active area of debate within the scientific community. For example, a widely-publicized example of the loss of sharks rippling through a coastal ecosystem—ecologists call this a trophic cascade—was challenged last year. These new results provide additional evidence that under some conditions, sharks can be extremely ecologically important.